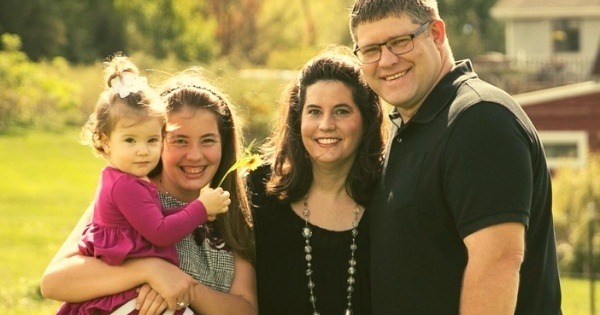 Aaron and Holly Menning remind us in this feature that there is no mold for what a homeschool family looks like. Whether you’ve been called to lead one or eight, these are hearts that you’ve been blessed to help turn towards the Lord. Aaron and I have two girls. Cori is my fun-loving, relational 12-year-old who does her best and is very easygoing. Hannah is our 1-year-old go-getter who knows what she wants and adds constant action to our used-to-be-calm home. The flexibility and ability to customize education to what fits our lifestyle and goals. Aaron works a non-traditional schedule so being able to have days off when he is home is a huge blessing. Most frustrating thing about homeschooling? Having to prioritize and not being able to do all the social events we want to. We have to be “home” to get our bookwork done. Biggest blessing that you didn’t expect when you began? Homeschooling has been a huge blessing in so many ways. The community we have is amazing. We knew that families that homeschooled had closer relationships, but we never dreamed it would be such a different dynamic with how children of all ages relate to each other and the mentorship that happens in those relationships. Also what a blessing having a business and homeschooling could be. Cori started to learn entrepreneurship at 7 years old when we started Small Barn Farm. She started to sell cookies and now has her own line of things she sells and makes her own spending money. We knew our children would be educated in a Christian school or homeschooled. When our oldest was 18 months old, we felt like Holly should quit her job. We knew then that we would be a homeschooling family. Have you homeschooled the entire time with your kids? We started homeschooling the day our oldest was born and plan to continue all the way through high school. How important is a local homeschool community for you? We feel like having a community is really important. We are a part of several online groups that plan field trips and park meet ups. In addition, we are a part of Legacy Christian Academy and they do some enrichment classes and plan parties and field trips. We make getting to the MPE Conference each year a priority, and Holly goes to Women’s Encouragement Day every year. As a homeschooling community, we need to support the networks that are in place so that they can continue to thrive. What advice would you give to families just starting out? If you are just starting out, we would suggest finding someone that has gone before you and reach out to them. Join MPE. Get involved in events. Find other homeschoolers around you and make connections with people. You recently had a major health setback. What is your best advice for homeschooling families faced with significant health challenges? It was more than a health setback. In 13 months we had something like 15 major stress events hit our family. It started with the birth of a baby and continued with the death of two grandparents; moves for both sets of parents; the passing of my beloved toy poodle, Belle; a bout of pancreatitis; and a massive heart attack that should have killed me. I was given less than 2% chance of survival. I should not be alive. Let that sink in. This mom is a walking miracle. The surgeon working on me doesn’t even know how I survived surgery. After so many stressful events, you just kind of sit back and ask yourself what is REALLY important? My advice when you are faced with hard things is to learn to say yes to help and realize your limitations. Things will be different from what you are used to and embrace the change. Slowing down can be good. Our community is AMAZING. We had so many people bring meals, step in to help with the girls, clean our house… nothing shows love like folding someone else’s laundry or scrubbing their toilets. We had to establish a new normal very quickly when I came home from the hospital after the heart attack. For a month, I literally lived in a recliner. I am so thankful to be alive and we know that God’s hand was all over me. I am a walking miracle, but I have so little energy. Having people come into our home to show us love has been amazing. This year homeschooling has looked much different from previous years. We have cut out most events and what we do is very limited. We stay home more. My oldest has more responsibility and is learning lots of “home” skills that are needed in life. We do more bookwork and are working ahead in our curriculum because we are home. When you are homeschooling in a crisis, you have to evaluate, what is the end goal? I want my girls to see we can adapt and we can push through the hard. It might be painful…but you will come out stronger. Advice for fellow families with one or two children and have made the decision to homeschool? Yes, for 10 years I homeschooled one student. I have always said someone needs to write a book entitled Homeschooling the Only Child, because it seems like everyone that homeschools has a large family and every book you read on homeschooling talks about older students working with the younger ones and having races to finish chores and sharing rooms and siblings grading work. In our family none of that applied. I think you have to realize that there really isn’t a mold for homeschooling. One child or two children homeschooling can still be successful. You are still just as much of a homeschooling family as the family with five kids. Your day just looks MUCH different! Thanks so much, Aaron and Holly Menning!